The Angelus Mountain Center is located in Altadena’s Chiquita Canyon, just above a residential neighborhood. Our 56-acre site is located just inside the Angeles National Forest, in a canyon rich with oak trees, scrub brush and other native plantings. Our property enjoys breathtaking vistas of the San Gabriel Valley below. For more than six decades, the campground has been dedicated to the use of children and the enjoyment of people of all ages. We treasure both the history and the future of this very special place. The poppy fields of Altadena, This photo, taken around 1875 to 1880, looks northwest across Altadena toward Millard Canyon. Chiquita Canyon is nearby. Many of the properties around Chiquita Canyon were originally government land where homesteaders laid claim in the 1870s and ’80s and eventually were granted title. The story goes that in 1884, two boys, Gordon Smith and Jimmie Elms, started out on an Altadena adventure, going west over a trail that led to the mouth of a canyon at the center of the Elms’ land. Accompanied by two small dogs, the boys walked up an old wood road, where stumps of pine trees along the way reminded them of the logging that had once been done in the area. Eventually, they came to a steep waterfall and following the east fork of the canyon found a stream of water, shaded by oak and bay trees. As the boys tried to climb down a steep cliff, the dogs started barking; they had spotted a large mountain lion climbing up the cliff. The boys, and dogs, quickly found another way down and raced home. Jimmie’s father and mother, who owned acres of apricot, peach and pear trees on their property, heard the boys’s story and realized that they had located a source of water that had previously eluded them (trees on their property had been dying because their own spring had not yielded enough water to irrigate all of the orchard). The Elms warned the boys not to tell anyone of what they had found--but the tale of a close encounter with a mountain lion was too much for them to keep to themselves. They told their nearest neighbor, an F.M. Hovey, of what they had seen, and Hovey and another man quickly realized the potential such water resources could yield. They, too, climbed up to the waterfall and stream, and then the next day, filed a claim on the canyon. The move was a blow to the Elms family. The property changed hands numerous times over the next 60 years, In 1944, the Camp Fire Girls, a service organization, purchased the property in 1944 for $7,500--money raised with individual contributions and bazaars. The group had been searching for a site for a camp since their previous camp, Kunike in Eaton Canyon, had been destroyed by flood in 1943. 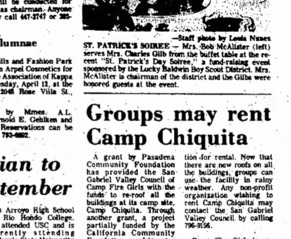 They named their new camp Chiquita, after the nearby canyon. The site was officially dedicated on November 11, 1944 (Armistice Day); a flag pole and circle, constructed by the Altadena Kiwanis Club, were the first structures built for Camp Chiquita. Donations from several area groups, including the Kiwanis, Pasadena Elks and the Altrusa Club of Pasadena, helped fund the building of our lodge, caretaker’s cottage, picnic area with barbecue and fire circle, which were all built in the early 1950s. Campfire Girl Charlene Spratt feeds a goat during camp at Camp Chiquita, 1969. Los Angeles Times. Many of our original structures, including our lodge, were designed by famed local architect Boyd Georgi--a founding member and president of the Pasadena & Foothill Chapter of the American Institute of Architects, who later became District Architect for the Pasadena Unified School District. Camp Fire girls and their parents sold cans of peanuts to equip the lodge and build its stone fireplace, at the heart of the building’s great room. Four overnight shelters were erected in 1958--also financed by the sale of peanuts--that are still standing today. A parking area was added four years later. Local girls, and later boys, used the site to explore nature and its beauty. 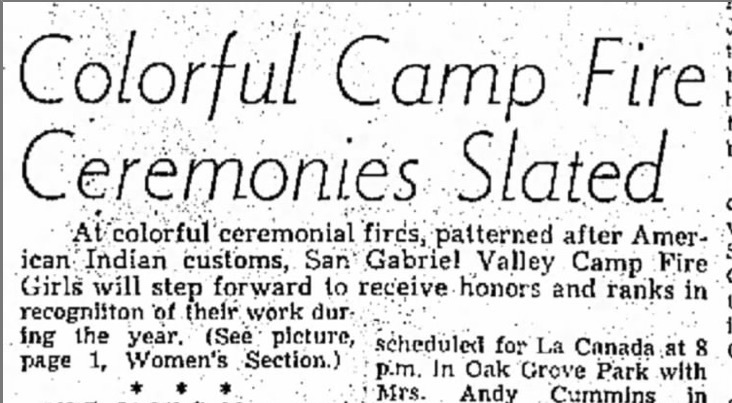 “[T]hey hike, study nature findings brought back from jaunts along the trails, read, dance, cook and work on handicraft projects,” the Los Angeles Times reported of girls attending the camp during the summer of 1954. Goats, chickens and other barnyard animals lived on the site for some time in the 1960s, much to the campers’ enjoyment. Campfire at Summerkids in the mid-1990s. But as time went on, the Camp Fire Girls began to consolidate their programs. In 1980, Summerkids, a summer day camp program for children run by Joe and Maria DiMassa, began leasing the property. The Camp Fire put the property up for sale in 1987, and the DiMassas bought the property in 1988 with plans to continue its use as a summer camp for children in K-6th grades. They added a swimming pool and changing rooms to the property--something that the Camp Fire had been planning to do since 1972--and have made countless other improvements to the property since then. Since then, improvements include basketball courts, patios, playground equipment, a 1,200-square-foot garden, rock climbing course and improved hiking trails. A lower camp area with obstacle course and gazebo has been utilized as well. And Summerkids has grown, too. Both a junior high program--serving 7th, 8th and 9th graders--and a PreK program have been added to the summer offerings. We look forward to a bright future on this special piece of land. SOURCES: Pasadena Star News; Los Angeles Times; San Gabriel Valley Council of Camp Fire Girls Inc.; “Altadena” by Sarah Noble Ives (1938); “Altadena: The Golden Years” by Robert Peterson (1976).